New direction and a free download! This has been retired. If you would still like it, please contact me. I’ve been thinking about goals this year and things I really enjoy doing and one of those is creating blog banners, buttons, and printable things like invitations. This year I’d like to delve more into digital design and offer some freebies back into the wide world given I’ve been taking freebies for years. I’m by no means a graphic designer and don’t claim to be, this is just a hobby for me, but it’s something I enjoy so we’ll see what I can come up with. 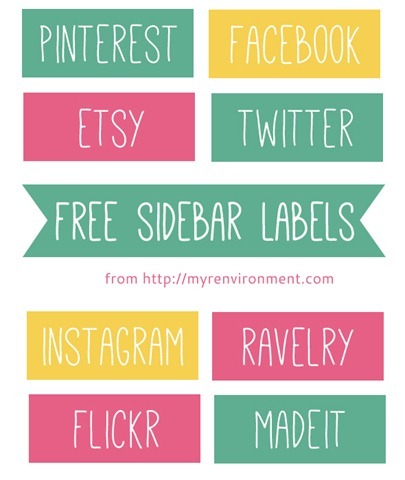 To kick things off I’m sharing some really simple blog sidebar labels. My style tends to lean towards simple as you can see on both this blog and The Red Wren. That’s not to say there won’t be some more fancy things coming, just that clean and simple comes much easier to me. This set is made with the craft blogger in mind. Why not add them to your blog sidebar and link to all your crafty accounts! The zip file contains ten 250px x100px labels, eight are shown below, plus a green ‘Craftster’ and yellow ‘Burdastyle’. To use these files on your blog you will need to upload them and create your sidebar links. If your sidebar is narrower than 250px wide you may need to specify the image size. There are lots of tutorials on the web to help you with this or leave me a comment with the blog platform you use and I’ll point you in the right direction.